What are the differences between the semiautomatic and automatic cloth strip cutting machine? The semiautomatic cloth strip cutting machine can normally automatically move left or right once without error operation. It has the similar working mode with automatic type, with manual cutting function basing on those performances of automatic type, which can improve the working efficiency greatly. 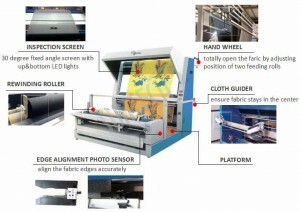 First, cloth strip cutting machine is equipped with infrared protection device. When the blade device move, such as pull the handle, the CNC system will start the infrared security device, then the red light will be turned on to protect the blade. Second, the correct using of button beside to the control panel. The cutter can not only move automatically, but also can manual control the movement. So if you want the cutter to move automatically, you need to start the right button on the control panel. Third, compared with automatic type, the semiautomatic type is just short of one big power motor and some circuits. 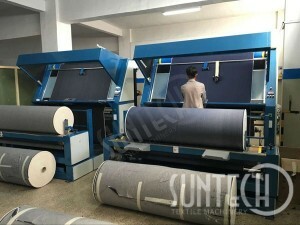 Remarks: The semiautomatic cloth strip cutting machine is designed according to the customer experience, with the security function in the CNC system. When the machine goes wrong, the moving will stop to protect the operator. So it is necessary to use the machine correctly according to the regulations, when the cutting finished, then press the handle to the next step, to ensure the machine goes well. 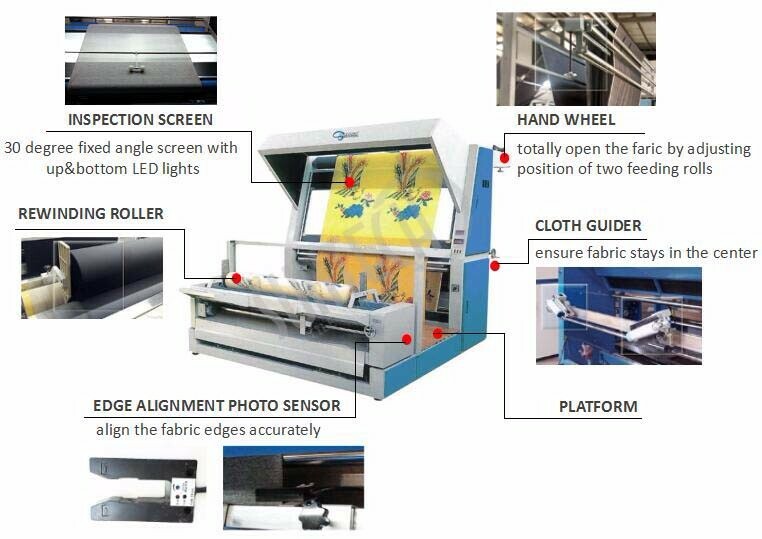 2 The advanced electronic counter meter in china for the counting of the fabric length (amends, determines and totalizes the fabric length in meter/ yard as well as displays the rolling speed). SUNTECH Woven Fabric Checking and Rolling System Cloth Inspection Machine is suitable for a wide range of woven materials. It is an economic type for denim fabric also. How to choose a good quality fabric strip cutting machine? Currently in the textile machinery market, there are complicated kind of strip cutting machine, the features of those machines are almost similar, but just the price is different. We cannot distinguish them from the appearances, so what can we do to choose a good one? 1. The classification: currently the strip cutting machine can be classified into pneumatic and automatic type. Though the pneumatic type is lower prices, unstable and force lack, it is just suit for light weight clothes and fabrics instead of heavy and thick materials. The automatic one is suitable for all kinds of materials with stable and strong cutting force, CNC controlling system, easy loading and unloading of materials, and free of edge burning. 2. Inner machine parts: from the appearance we usually cannot tell what the differences among those machines are. But for the professionals it is easy to do. Such as the round blade quality, good or not will affects the costs. Furthermore, the CNC system will show the factory’s credit and strength. 3. Durability: it is largely relate to the whole working station structure. Checking whether it has protection shield that can protects the linear guide rail and ball lead screw from dust, and saving the space of the station. The body of high quality machine is casting, though the cost is higher, the reliability is stronger, which can hold the heavy materials easily to ensure the durability of the machine. Warp knotting machine is used to connect various warp yarns fixed on the knotting frame, it adopts world-class knotting technology, and enjoys high performance, high efficiency, high flexibility and high quality, it is an ideal knotting solution for demands from all weaving workshops, and we have also made invention to extend its application in warp knitting industry. The machine is equipped with the latest designed knotting frame and the most reliable knotting mechanism, the preparation of warp yarn becomes simple and swift, and the knotting process is quite short, which dramatically reduces the waiting time of the weaving and knitting machines. For warp knitting machines working with coral fleece, flannel, velvet knitting frabrics, the pile yarn beams finish very fast, the manual knotting or even the threading work take a lot of time, warp knotting machine for warp knitting machines provides the special knotting machine and full accessories specially required for warp knitting machines, and makes the knotting of pile yarns on warp knitting machines an easy and fast procedure. Unique design for comfortable & efficient mending operation. Top & bottom illumination for efficient mending. Hands free foot operated system with fixed or variable speed drive. Machine with any input & output of Roll/ Pile can be manufactured. High production efficiency with minimal operator fatigue. 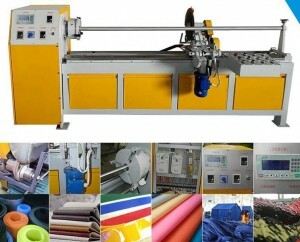 This Fabric winding machine is suitable for cinspecting and winding fabrics in big batch.